"Hey Hillbilly Singer!" picks right up where his last CD left off, with high energy honky tonk songs, Texas swingers, two-steppers, truck stop rockers and tear in your beer ballads that will transport the listener into a dark, neon lit dive bar with sawdust on the dance floor and ice cold long necks in a bucket. Scott Southworth explains, "We record fast and loose with the best of the best pickers Nashville has to offer. And given the Pop Country style that's all the rage in sessions these days, these musicians are energized and excited to dig into the type of music that made them move to Nashville in the first place...that enthusiasm shines through in the recordings and raises my vocal performance as well! The eleven track collection is getting some impressive reviews. 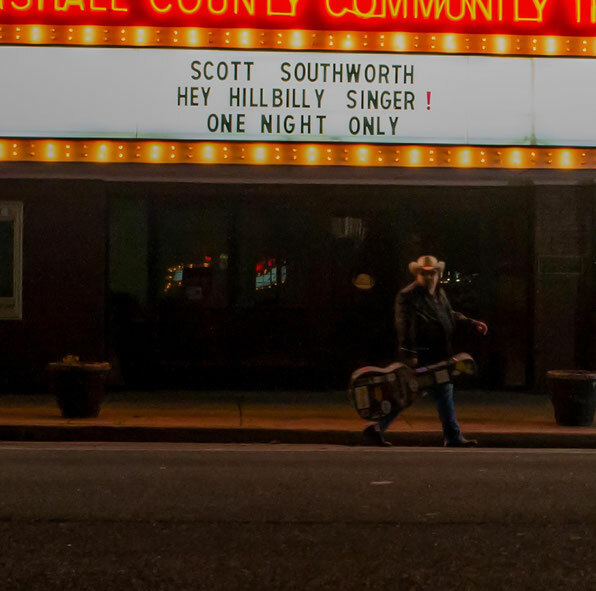 "The battle for traditional country artists in Nashville gets a stiff upper cut from Scott Southworth and Bobby Marquez with their new song 'I Ain't Leaving Town' The song personifies what my radio station stands for which is real country music the way it should be !" states Scott Wikle, host of the North American Country Music Association International Radio Station of the Year, My Kind Of Country-MKOC Radio. Scott Southworth single-handedly wrote eight of the eleven cuts, co-writing the other three. Scott shares, "The title track idea was actually born in the studio as another song was being cut. As we were all listening to my rough guitar vocal reference track, guitarist Brent Mason came around the corner and exclaimed "Hey! Who's That Hillbilly Singer?" while clapping me on the back. As I drove home that night, Hey Hillbilly Singer just kept rolling around in my head and wouldn't leave me alone until I got to writing, then called my pal Marc Alan Barnette to help me wrap it up!" 8. Why Can't Every Day Be Friday Night?